In imaging, speed is critically important. When imaging is slow, workflow crawls and grinds to a halt. When speed thrives, it’s instantly recognizable and truly magical. Welcome to the magic of Visage 7. Visage 7, powered by server-side processing, delivers amazing speed practically independent of modality type, the number of studies, or size of studies. Whether users connect local or remote, via the LAN or WAN, Visage 7 performance is largely equivalent and incredibly fast on connections as nominal as 6 Mbps. The Visage 7 architecture includes a virtualizable Visage Backend Server connected via patented streaming to one or multiple Visage Render Servers powered by commercially available GPUs. An intelligently managed Visage 7 image cache always ensures the current study and all related priors are available for viewing. 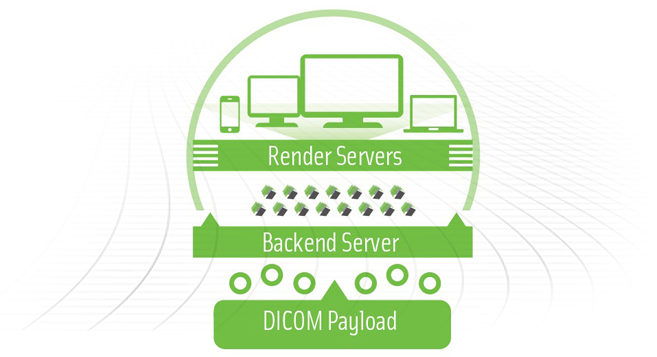 A technically elegant solution, the full DICOM payload never leaves the Visage Backend Server and only the necessary lossless image pixels are adaptively streamed to requesting client devices. For example, performance is nearly comparable across any modality type, whether the study is a 2-3 image CR, a DBT study, or a multi-thousand slice CT with multiple priors. On the server-side, performance is incredibly fast. Patented, platform independent, ultrafast adaptive streaming via thin-client, down to consumer grade bandwidth of 6 Mbps, even over VPN and Citrix. Amazing performance is practically independent of modality type, as well as the number and size of studies. Current and prior images are never cached to local disk, and displayed nearly instantly, on-demand. Because Visage 7 leverages speed from server-side processing, outstanding performance at the client is essentially independent of RAM, local disk speed, local disk capacity, number of displays, number of cores, CPU speed, and OS. Ultrafast speed is also delivered to mobile users via Visage Ease Pro and Visage Ease. Visage Ease Pro includes FDA 510(k) clearance for the mobile diagnostic interpretation of all imaging modalities except mammography.